In this digital era, having a secure and functioning way to save photo albums for posterity is just mandatory. Not every format can offer the level of safety and quality of a PDF file, and thanks to software development, there are apps that allow the user to convert any image file into PDF without concern. One of the best image to pdf converter is Advanced Scan to PDF Free, a software which offers a true experience of quality and efficiency to users. Why using Advanced Scan to PDF Free instead of an online tool? Most online tools are not free, and the amount of money you need to pay does or ensure quality not efficiency while converting files. These tools are also filled with membership plans that make the experience even more tedious, thus not every editing option is available from the start. In contraposition, Advanced Scan to PDF Free gives users the best quality and range of options from the beginning. Malware is more than present in online tools, coming from abusive ads, pop-ups or links that can totally endanger the machine in which you are working. Without even noticing it, your pc could be getting poisoned and infected with countless viruses you would totally miss out if you downloaded Advanced Scan to PDF free. This software does not have any threatening ads nor weird pop-ups that slow down the working process. Online tools often require several downloads of features to fully live a good experience when using an image to pdf converter. With this software you will only have to make a single download and then, you will have the possibility to edit and convert your image to pdf any way you desire. Q: Can this software truly convert any image to PDF including GIF files? 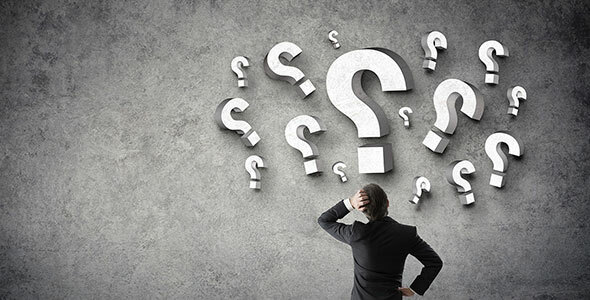 A: That is correct, Advanced Scan to PDF Free has the best technology on the market to allow users to convert countless numbers of files like JPG, PNG, GIF, TIF, BMP, etcetera. 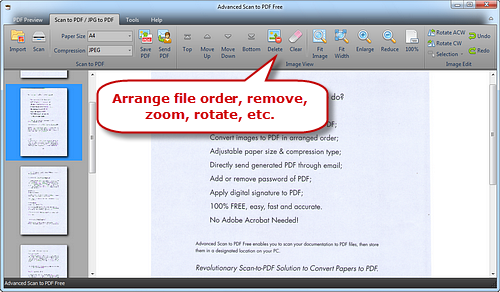 Q: I would like to protect my PDF files without having to reduce the quality of the final product, is there a way I can do that with Advanced Scan to PDF Free? A: Confidentiality is an aspect this software cares about, and will allow you without question to protect PDF files using passwords as an encryption method. This measure allows restricting any unwanted reader to get his or her hands on your conversion work. This restriction will forbid to view, edit, reproduce or comment on your PDF document so that you will feel safe enough. Q: Is there a way to add my identification into the PDF File converted using this software? A: Advanced Scan to PDF Free allows to digitally sign the PDF files, in order to avoid any falsification threats. Authentication is now easier than ever, so the author can feel that its file will stay unaltered after the digital signing. Q: How much quality can I expect from a free Scan software like this one? A: Advanced Scan to PDF Free is a remarkable example of those situations in which a free service surpasses the quality of priced and expensive apps that only care about profit. This software is built for the user to feel satisfied at any step of the process. This scanner can even produce similar quality compared to the original file, and each scan is OCR (Optical character recognition) suitable. But is goes even further as you can totally choose the level of quality you require your PDF File to be, whatever your needs are for this project. How to convert an image to PDF to make a digital photo album with Advanced Scan to PDF Free? The first thing to do before living the amazing experience of using Advanced Scan to PDF Free is obviously to download it and launch. It will only take some minutes. 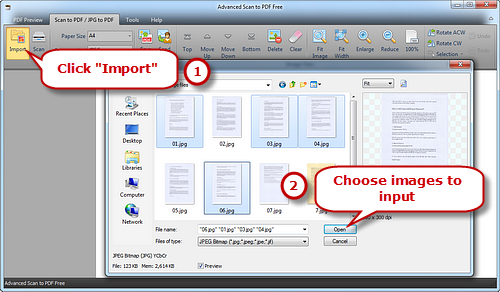 Once you launch Advanced Scan to PDF Free, click “import” to select the photos about to be converted. If you want to convert more than one photo, you just need to press Ctrl or Shift key. Step 2. Organize the photos and prepare them for conversion. First, you need to click “Open” and it will appear the thumbnail of each photo displayed in the previewing window. For organizing the selected files, you can use “Top/Move Up/Move Down/Button” or only drag the chosen photo to the desired place. Any unwanted file can be deleted using either “Delete” or “Clear” and if you need to adjust the size of the photo, you can simply use “Fit Image”, “Fit Width”, “Enlarge” and “Reduce”. If the up-right position is incorrect, you just need to change it using “Rotate ACW” or “Rotate CW”. Step 3. Convert the images to PDF. Once you adjust the size of the selected photos, then choose “Select Page Size (A0-6, B5, Letter (8.5″ × 11″), Legal (8.5″ × 14″), ledger (17″ × 11″) and compression (RLE, G3Fax, G4Fax, JPEG). After this, press “Save PDF” to output the soon-to-be PDF file on the needed folder and then “Ok” to finally convert the photos to PDF. Advanced Scan to PDF Free is one of those software which totally changes the way users experience the handling of an image to PDF converter. It does not only offer a huge length of available image files possible for conversion, it also grants the highest quality on PDF files once the process is done. This software is surely the best that could be found, and the fact that it is free and easily downloadable will give it enough power in the market to survive and improve over the course of the years. Your PDF files are going to be excellent and you will feel relieved in the fact that it is not only a good piece of work, but it is impressively protected for any attempt of falsification. 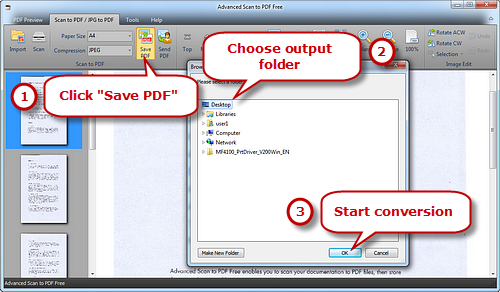 Do not waste any more space on your hard drive for other scanners and download Advanced Scan to PDF Free.